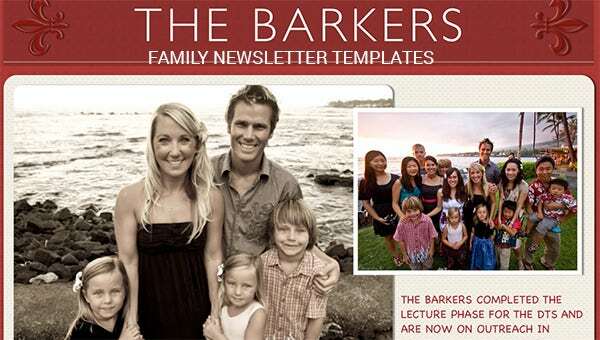 7+ Family Newsletter Templates – Free Word Documents Download! We all know how important a family is. It is the single most important and valuable basic unit that makes up either a peaceful or a pain in the neck kind of society. Families are trying to be good nowadays and that is good news, as peace in homes means peace, love and unity in the society as a whole. You can also see Classroom Newsletter Templates. worddraw.com | Family News Letter Template is a colorful theme available to you for free download. This design features fully editable options and minimal designs. For limited circulation, the theme is an apt choice. 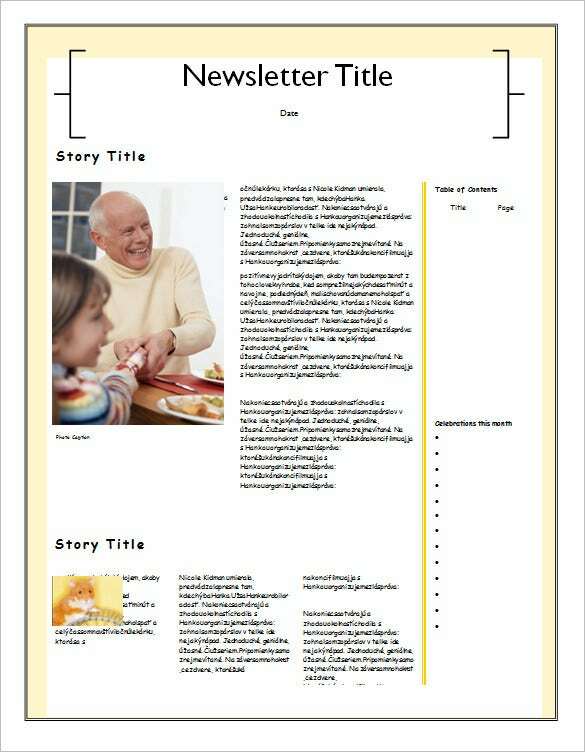 Exclusively crafted for Christian families, Sample Printable Family Christmas Newsletter Template is a free design with basic features. It is editable and comes with easy to use interface. brighthub.com | Vivid Blue Family Newsletter Word is a 4-page family newsletter template designed in blue. The theme is unique and has incorporated all basic features could be used as monthly, bimonthly or annual editions. 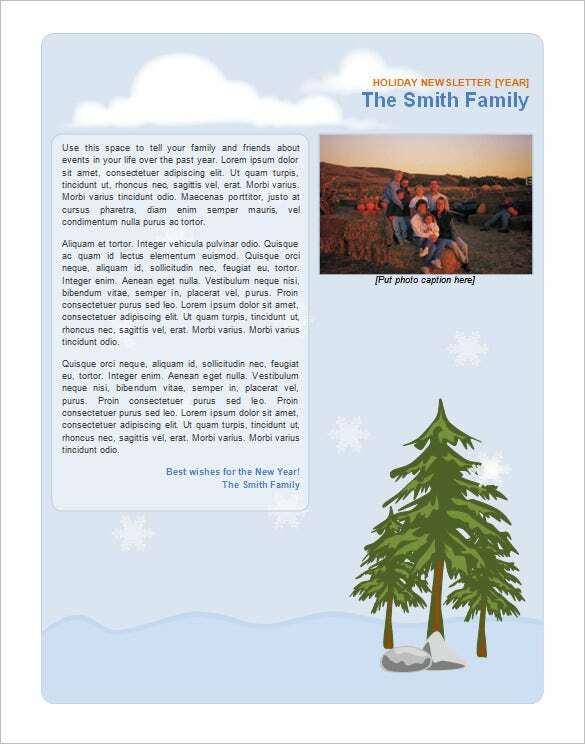 Family Holiday Newsletter Template is an apt design for family template designs and could be editable according to your needs. 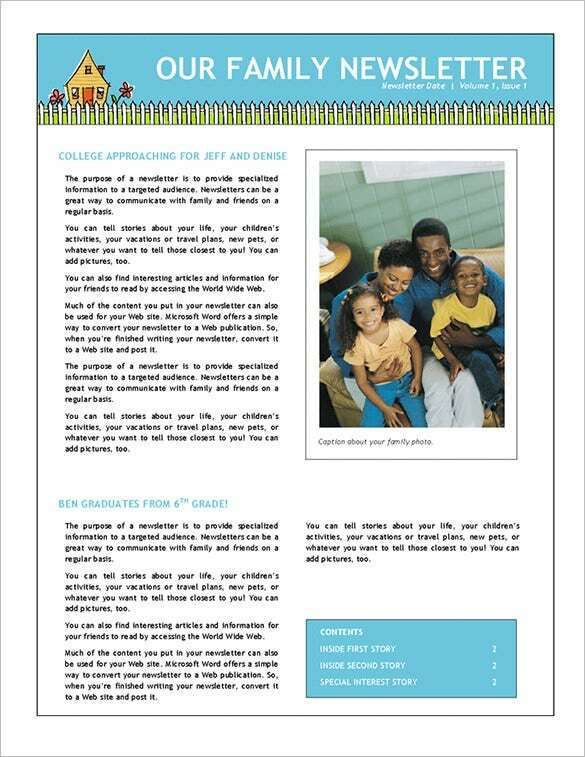 The theme comes with everything you needed for a family newsletter, like photo sharing, article columns etc. 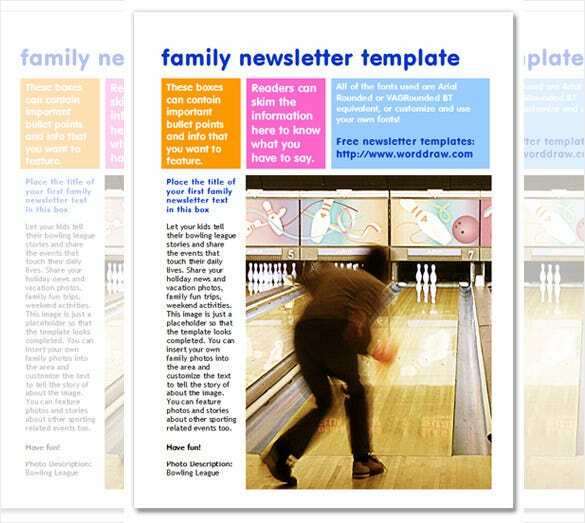 Microsoft Word Family Newsletter Template is a free website template available to you and features 2 pages. It has space for personal articles and photo sharing, also, the theme is fully customizable. brighthub.com | Single Page Family Newsletter is a little but elegant family newsletter template for free download. This creamy design has enough space to tell your family story and share your images. 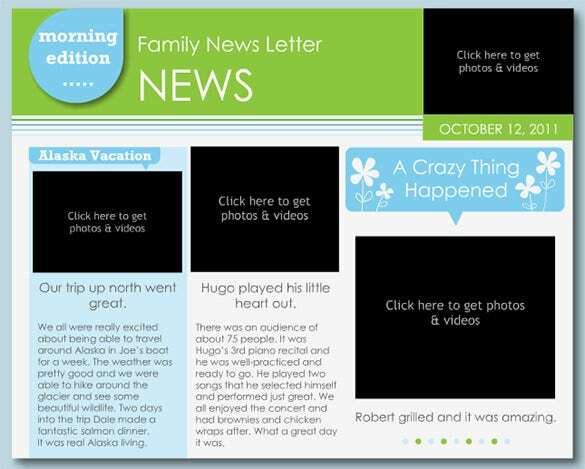 You wanna detail about your last family trip or something special in your family, Family Newsletter Template Creator Software Download allows you to create your own design for your newsletter template. This is very easy to use and customize, with many designs and concepts hinting. I love writing family events for the past month. It somehow helps my family to understand itself better. Usually, I let every person at home contribute their points, and then we put them all together, edit accurately, and then print the newsletter and let the entire family have a look. The use of printable newsletter template actually comes in handy because it is a valuable tool to ease the process of writing the whole thing. I actually download the free email newsletter template every month for newsletter writing in the family. 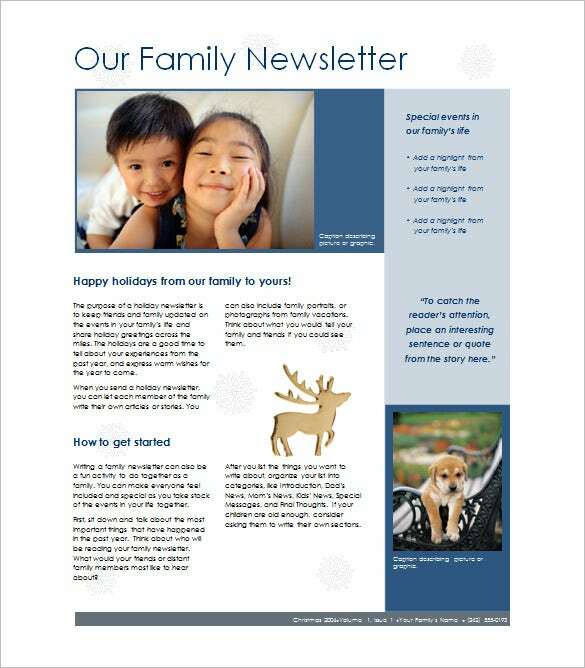 I am glad that I do not have to spend more time on my computer than necessary because with the Family Newsletter templates Examples already available, creating a design layout from the bottom up is definitely a waste of time. I also end up compiling the content contributed by my whole family with ease and within the shortest time possible. I would recommend the use of templates to those out there who are not using them yet.